"Our development goal was straightforward. 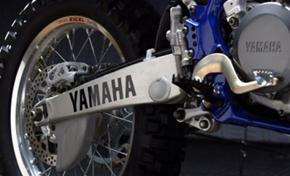 We wanted to build the strongest motocross machine", says project leader Hayashi-san. To achieve this goal no compromises were made. The result is a completely new machine, with an all new engine and chassis. Huub Forschelen from Yamaha Motor Europe is convinced: "The YZ 450F is setting the standards for 4 stroke motocross bikes again. We used both new materials and new layout in order to build a machine that is superior to today's 2 strokes. " Huub continues: "For decades, highly competitive motocross racing has been associated with 2 strokes. 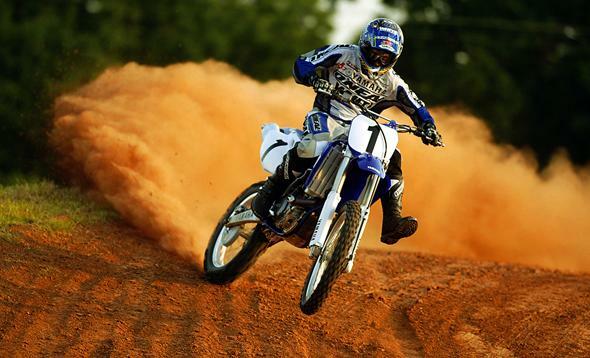 Even when Yamaha launched the epoch making YZ 400 F in 1997 (see YZ story) racers still thought that 4-strokes were too heavy. 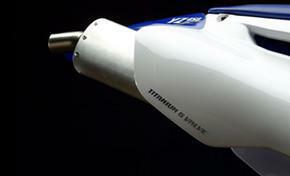 The YZ 450 F will irrevocably erase this preconceived notion that 4 strokes are 'heavy' machinery." 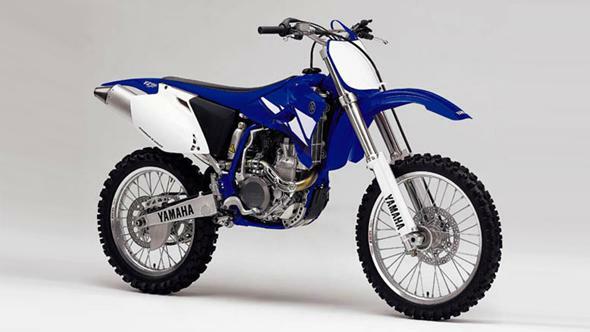 The YZ 450 F therefore is so new, that it would be a mistake to think of it as just a further development of the YZ 426F. The YZ 450 F development saw little influence from marketing people or stylists, the driving forces behind the project were the engineers with passion and knowledge for motocross. 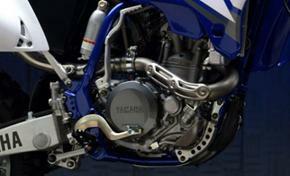 Increased displacement 450 cc: The liquid cooled 5-valve DOHC engine has increased stroke of 63.4 mm (compared to 60.1 mm of YZ 426F). Taking as its base the lens-shaped combustion chamber it has been further optimised to accommodate the increased displacement (the max allowed by new FIM regulations). 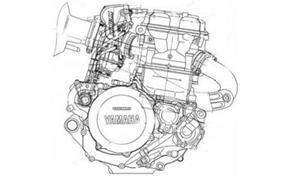 The 95 X 63.4 mm bore and stroke as well as the 12.5:1 compression ratio give this engine the outstanding power and torque a superior motocross bike needs. Reduction of inertial mass: The inertial moment of the moving parts in the crankcase assembly in the new engine has been reduced by 20% compared to the previous model, resulting in instantaneous throttle response, improved handling and overall weight reduction. The engine feels so lively and at the same time has an enormously wide power band, which allows the use of a 4-speed gearbox. 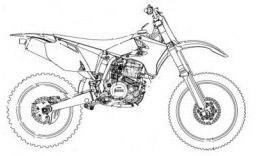 4-speed transmission: Sometimes less is more… instead of 5 gears the YZ 450 F needs only four gears, because of its wide useable power band. The advantage of this unusual “diet” becomes obvious when riding the bike fast on the track. 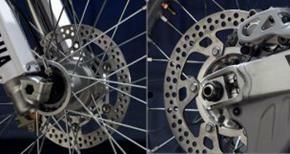 Riders discover a better smoother traction due to the wide gear ratio and spend less time on shifting. Lap times become faster! 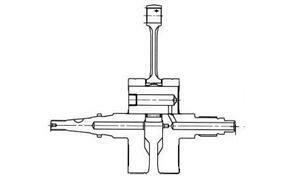 Shorter titanium valves and new piston: The cylinder head contributes a lot to the compactness of the engine. 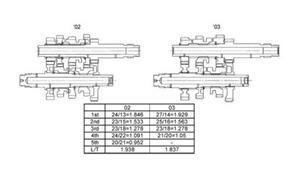 As on the last generation YZ426, titanium valves are used for all 5 ports, but these valves are shorter now and allowed the engineers to reduce the height of the cylinder head from 100 mm to 93 mm. As a result the new cylinder head is 10% smaller than previously. Also the piston itself is 7% lighter, since piston pin boss diameter has been reduced and the piston skirt was shortened, by 1.6 mm. 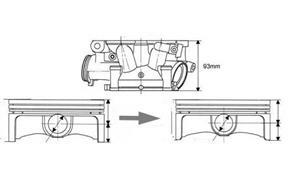 Re-designed oil tank and filler plug position: The oil circulation system was re-designed to both contribute to a lower centre of gravity as well as to lower weight of the bike itself, since oil volume could be decreased from 1.5 litre to 1.2 litre. The dry sump system is still using part of the frame’s down tube as oil tank, however, the position of this "tank" in the frame could be placed 20 cm lower than before. The relocation of this mass contributes to a lighter steering feeling. 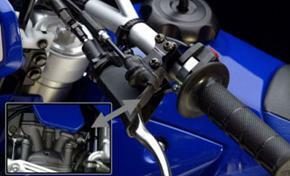 Titanium exhaust pipe: The new titanium exhaust pipe has 30% less weight. This influences the total weight of the machine significantly. Automatic de-compressor system: The use of a new automatic de-compressor, combined with the fingertip hot starter, gives this model much improved starting performance. This compact automatic decompression mechanism with it’s lightweight, compact-design assembly for the camshaft operates one exhaust valve and enables the use of a lighter kick shaft assembly resulting in a total weight reduction of 140 grams. Furthermore, the hot starter can be operated without taking the hand off the handlebar, which certainly is a great benefit for easy operation. 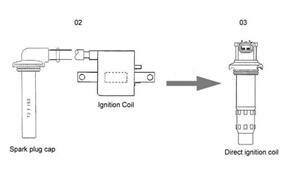 Spark plug cap integrated ignition coil: For the first time on a production motocross bike a direct ignition coil has been adopted. This coil is directly built into the plug cap and therefore reduces weight of the system and allows better use of space in this area in combination with a more compact CDI unit. 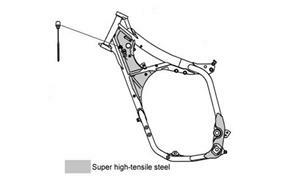 High tensile steel frame: Even with a 1.5 kg lighter frame than previously, the new semi double cradle frame of YZ450F is stiffer and more durable than before. This weight reduction was made possible using the super high tensile steel "YSC980Y". On certain areas of the frame that require particular strength and rigidity (as shown above), this steel sheet metal is used. It is so strong, that it cannot be pressed or cut with conventional processes and Yamaha is using a special process to adopt it. 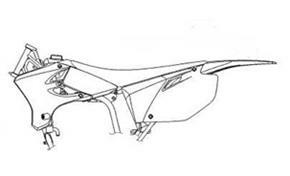 Other parts of the frame have the same steel used on the previous model to achieve a fine balance between rigidity and "pliability", which makes up the unique riding character of this bike. 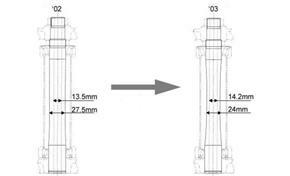 Optimised suspension specs & lightweight rear arm: Suspension settings needed to be altered to adapt to the increased rigidity of the frame and lower overall weight. 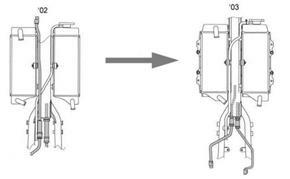 The rear swing arm is manufactured with a new "hydro forming" method, allowing a more accurate shape during the forming process compared to conventional methods. The result is a weight reduction and an optimised rigidity at the same time. Increased braking performance: The front brake performance was improved by changing the piston in the calliper from a resin type to aluminium, resulting in weight reduction and better brake feeling. The rear brake features a newly designed compact calliper with 20% increased calliper body rigidity and a more compact size and a lower weight. Light weight brake & suspension components: Many measures have been taken to reduce weight of brake and suspension components. For example: The steering shaft is slimmed down (as shown above) and the rear brake master cylinder features an integrated brake fluid reservoir, which is smaller and lighter. New designed seat & fuel tank for improved riding position: Mass concentration near the centre of gravity is essential for a bike's handling characteristics. The new tank layout has made a significant contribution to this. The tank volume was decreased from 8 to 7 litres due to the decreased fuel consumption of the new engine resulting in a small, flat tank. This enabled the designers to change the seat and rear fender position giving the rider more freedom of movement. Stefan Everts, world champion and the most successful motocross rider ever is convinced after he tried the new YZ 450F in first tests: "Yamaha has just got it right, a four stroke engine with pulling power over the whole rev range, put in a light and compact chassis to ensure proper handling. They just seem one step ahead each time when others are trying to catch up."